Written by Alonzo Solano The domestic and foreign tourists seeking for costa rica luxury tours, comfort and relaxation at theall inclusive hotels in costa rica, have a new alternative in the country. 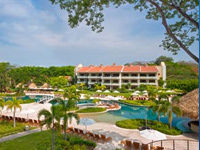 Starwood Hotels & Resorts Worldwide Inc. and Florida Ice and Farm Co., through its subsidiary Reserva Conchal, on Tuesday opened its first hotel in Guanacaste, Westin brand, under the "all inclusive" system. With the new hotel management, the aim is that visitors manage to feel the quality of customer service that offers everything you need during your stay. "This hotel is a combination, for being part of Reserva Conchal, a community atmosphere and a very luxurious, merged with the key differentiators of the brand. Our intention is that our guests feel better when they leave than when they arrived, "said Brian Povinelli, leader of the Westin brand in the global scope. The resort offers 406 renovated rooms, with of course, room service 24 hours a day where a chef could do a show for you, cooking with ingredients from the menu of your choice, becoming this, the one of the best travel deals to costa rica, if not the best. The food lovers can visit any of the eight restaurants, including the "Mitra", which offers a buffet. "The emphasis of the Westin brand is to offer its visitors options for maintaining a healthy lifestyle, we have created a very good performance in the various markets and has been key to global growth. Over 90% of Westin hotels currently under development will open outside the United States, "said Povinelli. On the other hand, the spa is one of the strongest attractions of the resort, offering treatments ranging from $ 100 per session, where patients can then enjoy steam baths, sauna and Jacuzzi. So now you know, if you travel to costa rica all inclusive resort are the best way to have a delightful time. Costa Rica Travel: Conchal a beach full of shells!